Website Design, Development and Back office integration for this UK Charity Challenge organisation. 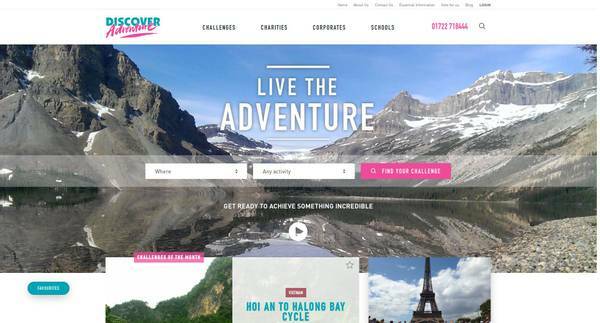 Discover Adventure - one of the World's leading Charity Challenge organisations approached us to revive their tired old website. It was running a Joomla CMS, but it wasn't set up correctly, had a tired old template, and couldn't handle certain aspects of their operation. It was a headache to administer. They also had to create all of their trip notes in Word documents and upload them to the site which was a time consuming process. We installed TravelZen and integrated it with their back office system so that there was no duplication of content loading, we set up PDF itineraries so they didn't need to create them in word, and we designed a smart new responsive template using their distinctive colours. The result is a very special website that is fully integrated with their bespoke back office system and is working hard for them to generate bookings, and for the Charities to raise lots of money! It's been great working with you all, you've done a fantastic job on our website, and I look forward to seeing it developed over the next few years! If you are a travel company with special requirements (and let's face it, no one company is the same) then please talk to us about your Website, Integration, Booking Process, SEO or PPC - we'd be pleased to discuss your requirements.